HP launched today at CES in Las Vegas the Photosmart M527. This is a 6 megapixel digital camera. It features 3x optical zoom, 7x digital zoom. 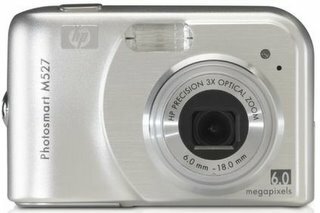 The M527 has a 2-inch LCD display and 16 MB internal memory. The camera will be available in April. You can find here all the news about the Consumer Electronics Show.